Since this is an international forum, I was hoping someone from the EU could help me decipher some transformer markings. Is this a 2.4KVA transformer or a 630VA transformer? I've searched the web and I can't figure out what the PN and PK designations signify. My guess: based on how it wires to source, Pn Phase to Neutral (star), Pk Phase to phase (delta). Sorry, but this is almost certainly wrong. 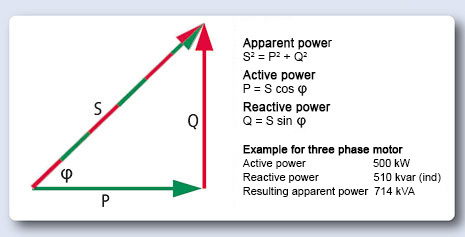 P_N is the nominal power and P_K is the short circuit power (K for Kurzschluss). So it's a 630 VA Transformer that can draw up to 2.3 kVA when it's shorted. Verb. is short for Verbinden, meaning that these terminals should be connected together. Anschl. is short for Anschluss, meaning that's where you connect the power source (probably the grid) or the load respectively. I have no idea what it began life for, but I want to use it to power some DC servo motors. I have 230V single phase input to the machine and I need something around 110-120VAC so it will be rectified below 180VDC. I need about 20A of the 150VDC this should generate so , 20A * 115V means I need a 2.3-2.4KVA transformer. I just cant tell if this is indeed a 2.4KVA transformer. The mixture of German and Greek is still too much for me ;-) What do Power DB (cosφ=1) and Power DB (cosφ=0.5) signify? Duty cycles? However the dimensions do compare favorable to what we 'Muricans would call a 2.4KVA transformer. Luckily, it's currently located in South Carolina USA! Even so, shipping is still a bear. What do Power DB (cosφ=1) and Power DB (cosφ=0.5) signify? I honestly can't answer what DB stands for. But φ (phi) is the angle between current and voltage. A transformer coil is a reactive load, so voltage and current are not in phase. When the voltage is at it's peak, the current is still rising. And when the voltage crosses zero, the current is still flowing. For an inductive load, the current lags behind the voltage( you need voltage to change the current) and for a capacitive load it's the opposite(you need current to change the voltage). The delay is usually not given as time, but as an angle, with phi universally used as the symbol for that. To make things worse even, cos(phi) is normally given, so you need to figure out yourself whether current leads or lags. Looking at the photos online I am confident that it is a 630VA transformer and not a 2400VA unit. A 2400VA EI cored transformer is huge. Normally this type of transformer would be used for powering the control system, say for a large motor starter where you have 3 phase input. The primary is connected across two of the phases which is suggested by the primary voltages 440/460/480 which are used in North America and the secondary is 115/230 for your contactors etc. P_N is the nominal power and P_K is the short circuit power (K for Kurzschluss). So it's a 630 VA Transformer that can draw up to 2.3 kVA when it's shorted. Verb. is short for Verbinden, meaning that these terminals should be connected together. Anschl. is short for Anschluss, meaning that's where you connect the power source (probably the grid) or the load respectively. Thanks, it has been way to long since my HS German class! Thanks Pawi. That's the info I was looking for. Google translate did good on the Verb. and Anschl. since I was expecting to find something like "short/jumper" and "load/load connection". I've located a couple of other transformers that look like better choices. 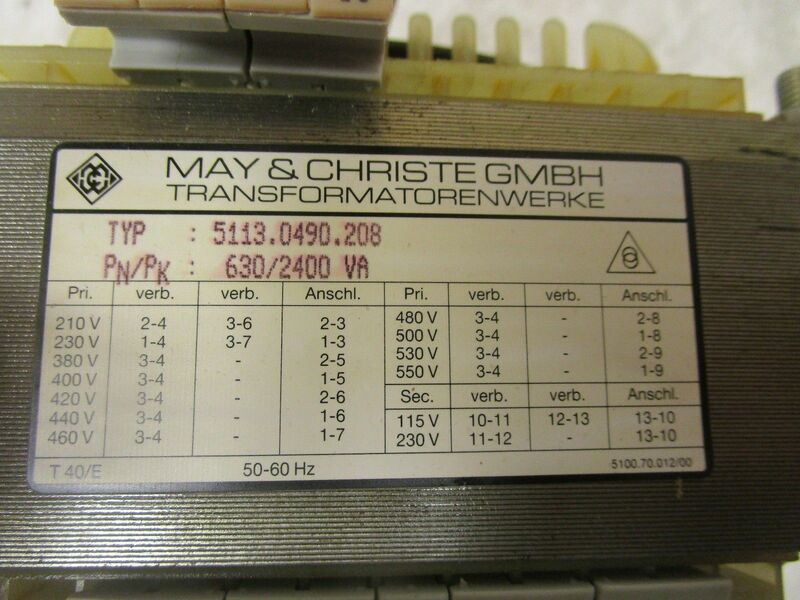 One is another German make, but it lists the amperage for the primary and secondary windings at each voltage as well as clearly stating it is a 2.4KVA transformer. Thanks everyone for your help on this! Can you provide the specs on the servos? That's a lot of (dangerous) power to be dealing with. I have four 40in-lb 180VDC motors that I'm powering. Do you have the specs on the motors? Current requirements for example? How many?